Artillery developed on the basis of the M24, with 60 vehicles actually produced out of a total of 250 ordered. The M41 did not see action in World War II, but fought in the Korean War. After its rebalance to tier V, he M41 will feel right at home in any match that it gets placed, as its 155mm howitzer is capable of dealing apocalyptic damage to any tank it gets to encounter and effective range that spans from one corner to a map to much of the other. However, mind that the shell travel time is slower than other Tier 5 SPGs. Players coming fresh from the M37 will never have to worry about poking higher-tier enemies for insignificant damage. After the total rebalance of every artillery piece, the M41 is now one tier lower (VI->V) and receives standard tank matchmaking (battle tiers V-VII). 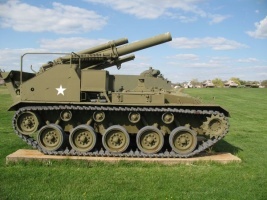 Formerly known for what was arguably the most enjoyable stock grind of any artillery piece (excluding tier IIs) in the game, the M41 embodies the American artillery playstyle very well: Good damage, good rate of fire, good accuracy, good top speed, great weapon traverse arc and horrible tank traverse speeds. The M41 is very similar to the old M41, but is arguably more enjoyable since it meets tier FIVE and SIX tanks, something impossible previous to this patch. The 155mm Howitzer M1's HE shells can regularly one-shot or penetrate KV-1s, KV-1S'es, KV-2s, French tanks and every medium tank in its matchmaking bracket, causing catastrophic damage to anything it sees. Non-penetrating shells still deal large damage, since its base damage is already high. Non-penetrating hits for above 300 damage are common. However, the M41 now suffers from a significant amount of reticule bloom. Be sure to move the reticule slowly and deliberately to preserve accuracy. The M41 shoots slowly now, although the great damage of the gun and cheap ammunition costs balance it out. After the nerfs and removal of many of its engines, the M41 does not accelerate as well as it used to. However, it's 15HP/ton ratio when upgraded and its high speed limit coupled with low weight allows it to outrun heavier tanks in contingencies. Worthy of special mention is the very low ammunition costs of the M41's 155mm howitzer. The Grille has a 680 damage gun costing 505 credits per shot, the Hummel has a 950 damage gun that costs 1150 credits per shot, the SU-122A has a 910 damage gun costing 810 credits per shot, compared to the M41's much more favorable 700 damage costing a meager 505 credits per shot, making the M41 a much more favorable moneymaking artillery piece. However, it no longer meets tier VIII and IX enemies, which somewhat hurts its moneymaking potential: Damaging higher tiers have a higher amount of money gained per damage. With that said, the M41 is an excellent tier V artillery piece, balancing agility, damage, speed and ammunition cost for a jack-of-all-trades artillery piece. Since 8.6 update, now all M37's engines and radios will carry over if you researched them previously. The SCR 610 and SCR 619 radios are also used by the M8A1, so they will be available if you played it prior to the M41. Research the Twin Cadillac Series 44T4 engine first since it has an inexpensive XP cost. Next research the SCR 610 radio . Lastly research the SCR 619 radio so you can once again have the excellent radio range if you haven't already. SC371824 - Lt. Gen. William M. Hoge, Commanding General, U.S. IX Corps, left, holds the lanyard which will fire the 75,000th shell to be fired by the corps since the start of the conflict in Korea. Brig. Gen. William N. Gillmore, Commanding General, Corps Artilllery, stands to the right of General Hoge. This day also marked the end of the first year fighting in Korea. 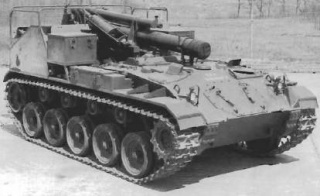 The self-propelled howitzer M41 was based on a lengthened M24 Chaffee chassis, and had many of the same modifications as the hull of the M19 self-propelled twin 40mm anti-aircraft gun. The M41's engine was moved to behind the drivers' compartment, and the 155mm howitzer mount was placed at the rear of the vehicle. Of the 250 ordered, 60 were delivered. 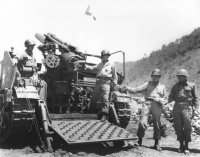 Cadillac Motor Car Division of General Motors Corp.
M41 Howitzer Motor Carriage Photos & history. This page was last modified on 23 August 2014, at 02:18.